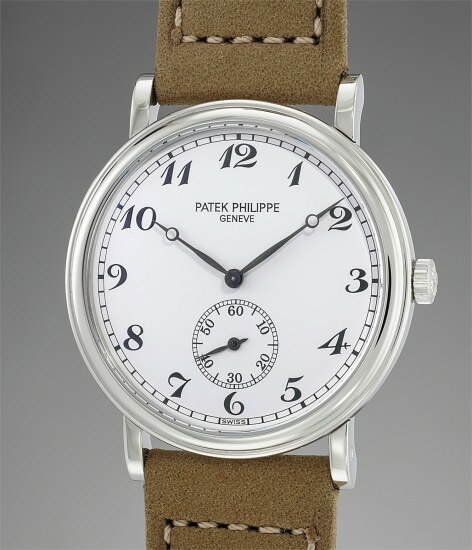 Patek Philippe reference 5022 was in production from 1997 until 2003 and it was available in yellow, pink and white gold, but the platinum version is by far the rarest. Cased in a traditional and timeless Calatrava case, this fine timepiece sports an elegant 33.5mm diameter. Designed to sit comfortably on the wrist and have the shirt sleeve cover it with elegance, this watch will perfectly complement the refinement of business suits. The present reference 5022 in platinum is in perfect condition. The lugs are proudly displaying crisp hallmarks and the black Breguet numerals contrast beautifully with the flawless white dial. Further accompanied by the original Certificate of Origin, this is the kind of timepiece that will appeal to any men of taste.